Expressive linearity combined with a bright palette characterize these miniatures, which delight in tints of blue, purple, and green. The compositions were influenced by the grisaille miniatures made in nearby Delft a generation earlier, as well as by contemporary woodcuts and engravings. The present manuscript's combination of Haarlem penflourishes with Delft-style border decoration on its facing pages may be surprising, though it is not completely unusual. 166 x 118 mm. – 200 leaves. 8 large decorated initials, 7 full-page miniatures. Dutch manuscripts can often be localized by way of their border-decoration or pen-flourish styles, as each larger town or region had its own style. Scholars found it complicated to name these styles, for which a characteristic element was often chosen, like the 'takkenbos' (bunch of twigs) in Haarlem decoration. Whatever the name, Dutch manuscripts are quite fascinating, as they show great variety over a relatively small region of prosperous merchant towns. 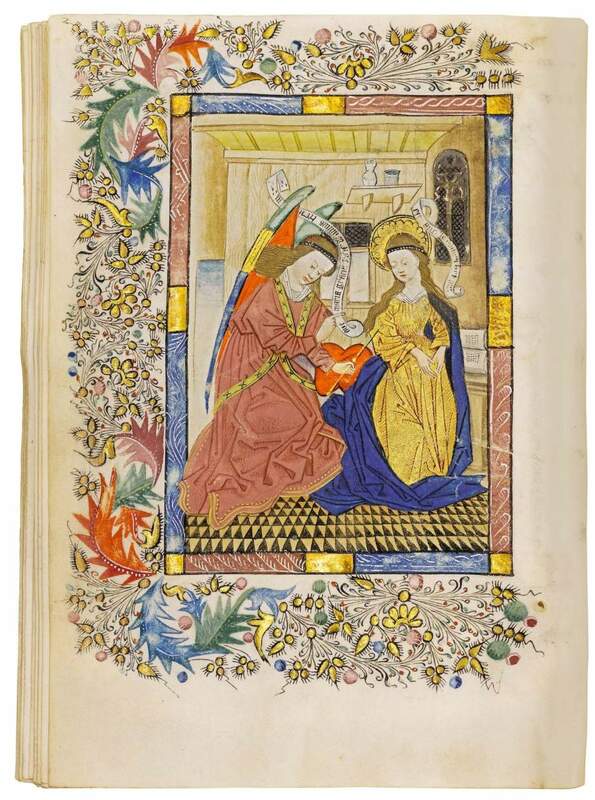 The present characteristic and colourful Book of Hours written in Dutch contains miniatures with border decoration (around three margins) consisting of the ‘takkenbossen’ style and acanthus foliage, characteristic decoration known from Haarlem manuscripts. The border decoration on the pages facing the miniatures, however, points towards an artist trained in Delft. His style is known as “kriezel” (scratchy), because of the short, hair-like linear forms in the margins. An expressive linearity combined with a bright palette characterize Haarlem miniatures, which favour tints of blue, purple, and green. Grisailles miniatures made in nearby Delft a generation earlier as well as contemporary woodcuts and engravings influenced their compositions. The present manuscript's combination of Haarlem penflourishes with Delft-style border decoration on its facing pages may be surprising, though it is not completely unusual as it is seen in another manuscript (now in Bruges). The first known decoration of the so-called Master(s) of the Haarlem Bible dates from 1445 (Brussels, Royal Library, ms. 21974). A much appreciated, vivid style of painting, its last known example dates from c. 1473-1474 (London, British Library, ms. Add. 16.951). The Delft border decoration in the Book of Hours at hand seems to point to a somewhat later date, perhaps around 1470, and the Haarlem Master miniatures in this book are contemporary. By the middle of the 15th century, the city of Haarlem had become an important centre of book production. Although several Haarlem manuscripts illuminated by the Masters of the Haarlem Bilble have been identified, their exact origin continues to be a riddle. The anonymous artist takes his name from the decoration in the three-volume Bible made for the Haarlem Knights of St. John (or Knights Hospitallers), thought to be among the finest in this style and revealing a great deal of ingenuity (Haarlem, Noord-Hollands Archief, ms. 187 C 1-3, ca. 1450-60). The Haarlem Priory of St. John was known as the house of the famous painter Geertgen tot sint Jans (c. 1460-1495). Several of the Lords Prior were great book collectors. The present manuscript is a very fine and fascinating addition to the oeuvre as it is known so far. Some ten years ago, the so-called Bout Psalter-Hours, decorated by the Master of the Haarlem Bible in 1453, came to the market (acquired in 2007 by the Royal Library in The Hague from Dr. Jörn Günther Rare Books). That manuscript is extraordinary as it shows painting combining work by illuminators from Haarlem and Utrecht. The present Book of Hours, combining Haarlem and Delft decoration, reconfirms Haarlem as a versatile city of art, forcing scholars to reconsider not only work practices in Netherlandish scriptoria, but also how artists interacted and the ways in which their work was combined. The book at hand is named after a later owner, Willem Pyll, who may have lived in Amsterdan or Utrecht.